Offering you a complete choice of products which include speed retarders, speed bumps, speed humps, plastic speed breakers, plastic speed bumps and rumbler strips. Keeping track of the latest market developments, we are introducing a precisely engineered range of Speed Retarders. Provided in different designs and specifications, these retarders are manufactured using superior quality raw material and ultra-modern technology in adherence with industry norms. The offered retarders are highly appreciated in the market for their various quality attributes. Besides, clients can avail these retarders from us at pocket friendly prices. Our product Thermoplastic Speed Retarders was developed keeping in mind the safety of people. This Speed Breakers conforms to government standards and industry regulations. New models of this Speed Retarders With Reflective Arrows keep developing to produce higher quality products without cutting corner. We offer extensive and comprehensive range of Speed Bumpers. Speed Humps is used in work areas which are prone to higher risk of accidents. We are remarkable entity, engaged in offering high quality Speed Bumps that are used where vehicle speeds are statutorily fixed to be low. The offered bumps are manufactured using the best quality raw material and advanced technology by our adroit professionals. Apart from this, quality experts test these bumps against different parameters in order to remove any kind of flaw in them. The product Speed Ramps is designed keeping in mind all innovative approaches to workforce safety and demands. 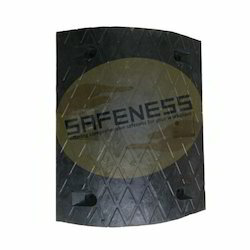 In addition, we offer varied range of Speed Cushions which are being widely used in industries like Metallurgical, Steel, Aluminium, Power, Energy, Petrochemical, Oil & Gas, Glass, Chemical, Cement Offshore & Onshore Industry, Furnace Areas, Fire Departments, etc. Our renowned company is considered amongst the prominent manufacturer, exporter, retailer and supplier of the best quality Speed Humps that are used in heavy traffic areas. The provided humps are manufactured using superior quality raw material and progressive technology in adherence to industry norms. Furthermore, quality examiners test these humps against different parameters so as to ensure their quality. Clients can avail these humps from us at market leading prices. We are known for creating a wide range of innovative and sustainable products for the industrial markets among which Speed Bumps stands on its design, strength and reliability. 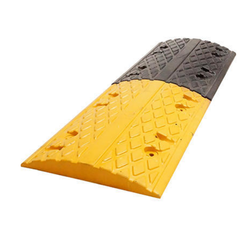 Speed Breakers is recommended for labours, workers and inspection officers to use while performing their duties at the site.These ABS Plastic Speed Breakers are finely finished and are known for their ability to provide optimal protection. We have over two decades of vast industrial knowledge and experience in producing superior quality Speed Bumps. 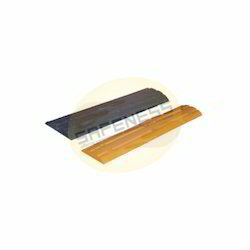 We are long-time established manufacturer, distributor, importer and exporter of Sleeper Lines. These Audible Lines are being exported to global regions like of Middle East, Africa, South Asia, Latin America, Europe, Bangladesh, Bhutan, Nepal, Sri Lanka and many more. Our Rumble Strips follows industrial norms depending on the product. 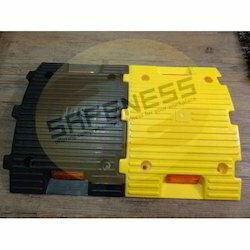 We have marked a distinct position in the market by providing high quality Polymerised Rubber Speed Breaker . Offered speed breakers are made available for the clients in diversified specifications as per their demands. 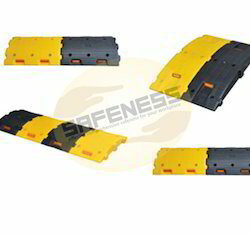 The provided speed breakers are manufactured using the finest quality Polymerized Rubber. We assure our customers that these speed breakers are checked at each stage of production process. Speed Breaker helps in protecting workers from life-threatening hazards at the workplace. 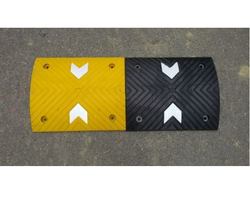 We have marked a distinct position in the market by providing high-quality Speed Breaker With Reflective Arrow. Offered speed breakers are made available for the clients in diversified specifications as per their demands. The provided speed breakers are manufactured using the finest quality raw material and sophisticated technology. We assure our customers that these speed breakers are checked at each stage of production process. Looking for Speed Breakers ?